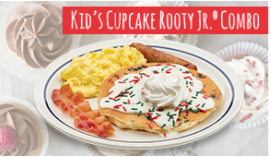 Now through December 18th IHOP is offering a FREE Kids Meal With the Purchase of an Adult Entree! This is valid from 4PM-10PM for kids 12 and under. Please note that the included meals must be chosen from the kid's menu. No coupon is necessary!